An inquiry into the results of meditation, inner quiet, the way of non-violence, expectancy, and humility will make the available mind and life. 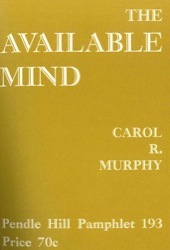 Carol Murphy (1916-1994) devoted the majority of her life to the study of religious philosophy and pastoral psychology at Pendle Hill. She first studied political science at Swarthmore College and International Studies at American University. She found her true vocation as a writer and an editor in 1947, when she moved to Pendle Hill. She published seventeen books and pamphlets with Pendle Hill Publications, making her one of its most prolific authors. In addition to her writing, she was a member of Swarthmore Friends Meeting and served on the Pendle Hill Publications Committee and the board of the Friends Historical Library.